Just after the Tsunami in Thailand we visited there that January volunteering with relief. We have friends that live in Bangkok. One of the other volunteers was a doctor and was hiking up to a nearby village that was not accessible by any other means, other than a helicopter. We passed several amazing waterfalls. It gave me an opportunity to play with my ND filters. It wasn't until I got home that we discovered the wee heart on the rock. A bery nice image Emily, The colours in the rocks surprised me in what looks like a dark situation. The heart an added extra. This is a wonderfall image (sorry, couldn't resist!). The heart is perfect for today...Happy V-Day! 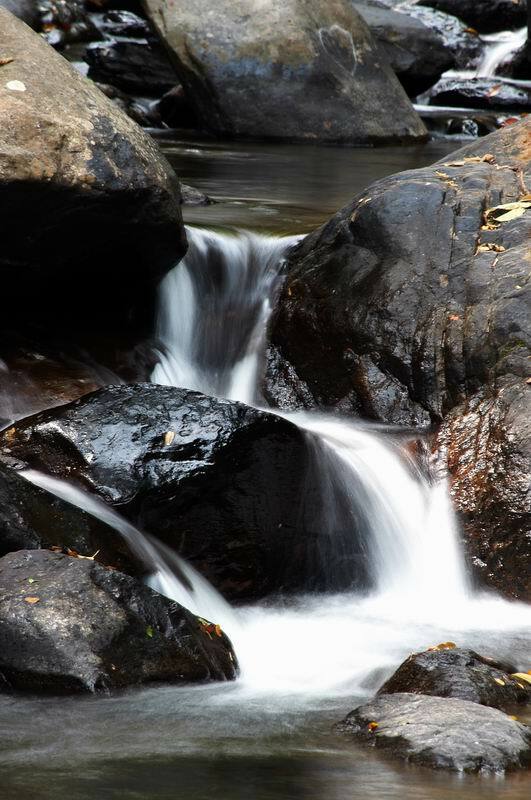 I like this...the milky water and the contrasting dark rocks. Well done...and I love your story. Emilie what a beautiful picture. The contrast is great with the dark rocks and the water. Sure wish my pics looked like this !! What a lovely story to go with a wonderful image Emilie. The water is wonderful. Love the blur that you have in it. Very well done in all respects..